Post-WW II Berlin. Nelly (Nina Hoss), a concentration camp surviver, returns home after having suffered a gunshot wound to the face. (No explanation is given as to how it happened.) After reconstructive surgery that leaves her looking like her old self (but, y'know, different), she embarks upon a mission to locate the husband who may--or may not have; she's not really certain--have denounced her to the Nazis. Does she still carry a torch for him, or is revenge in the offing? PHOENIX, the latest triumph by critics' darling Christian (BARBARA) Petzold, keeps us guessing, and the suspense is both unnerving and delicious. When Nelly and Johnny (Ronald Zehrfeld, fantastic) finally cross paths, he doesn't recognize her. (Like I said, she kind of looks like her old self only different, and she's now going by the name of Eva.) Her passing resemblance to Nelly gives Johnny ("Call me Johannes") an idea, though. If Eva pretends to be Nelly, she'll be able to claim the inheritance being held by occupying Allied forces. They can split the money 50/50, then go their separate ways. You don't have to have seen a lot of 1940's Hollywood film noirs to know how this is going to end. Everything builds to a climactic scene so flat-out incredible, so fraught with conflicting, ricocheting, transcendent emotions that it ranks with the greatest moments in cinema this decade. Some have criticized PHOENIX for trivializing the Holocaust by making it the backstory of a romantic thriller in the VERTIGO tradition. But this very real historical setting only enhances, ennobles even, the dramatic ballast of the characters. 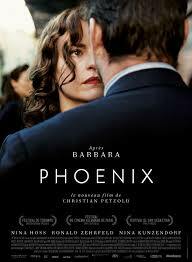 Of course, PHOENIX is a movie that is haunted on multiple fronts. Besides the starkness of a (still) war-ravaged city and horrific memories of the camps that stalk Nina and fellow survivor Lene (Nina Kunzendorf, quietly touching) like malevolent ghosts, there's the whole specter of the German New Wave to contend with. Specifically, the work of Rainer Werner Fassbinder, that filmmaking movement's brightest light. The baroquely stylized Berlin recalls Fassbinder's biggest hit, THE MARRIAGE OF MARIA BRAUN. Plus, the nightclub (the titular Phoenix) where a good portion of the movie takes place (Nelly was a singer and husband Johnny accompanied her on piano) is richly evocative of the hothouse cabaret atmosphere of both LOLA and LILI MARLEEN. The key artistic difference between Petzold and Fassbinder isn't simply a matter of heterosexual versus homosexual sensibility. It cuts much deeper than that. For Fassbinder, genre (especially domestic melodramas like the ones his cine god Douglas Sirk used to make) was a prop, a tool, a way to explore his pet theme of emotional fascism and how it poisons virtually every relationship: men/women, men/men, women/women, parent/child. Because Petzold is a film nerd who digs rummaging in the past (think of him as the Coen Brothers' long-lost Teutonic sibling), genre is akin to a toy box. And with the Hitchockian trappings of PHOENIX, he's found a really cool playground to roam around in. One thing's for certain. Petzold is the best thing to happen to German cinema since the halcyon days of Fassbinder, Herzog and Wenders. 4 out of 4 stars.